* Twin Acoustic Super Charger® (ASC®), MUFFLER-FREE ™, Cat-Back system. -Knowledge is power! . . The power is yours! * Complete, smog legal Cat-Back system! - No need to modify anything. Campbell X-Pipe™ exhaust is designed to be your complete performance solution. You don't need to spend thousands on headers & off road conversions. Campbell X-Pipe™ exhaust gives you more power than those systems, without the hassels and expense. Why fight success? * 2 1/2" free flowing system with 4 Chrome tips. -Generates 3 power peaks; at 2,000, 4,000, & 6,000 rpm! * X-Pipe™ exhaust puts the fun back in driving. * Twin ASC® X-Pipe™ exhaust out performs titanium! _Muffler-FreeTM technology allows Twin ASC® X-Pipe™ exhaust to weigh less than a conventional titanium cat back system. -Less weight, more power, less cost! 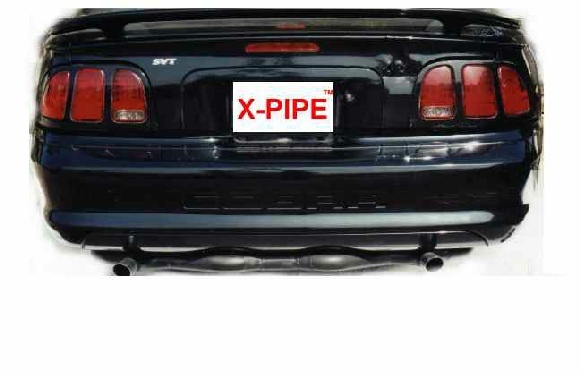 -X-Pipe™ exhaust gets the lead out! -Twin Acoustic Super Charger® technology beats scavenge every time! -No rigged magazine tests needed! -No risk, nothing to lose except dead weight! Please Note: This system is not compatible with sub-frame connectors, which may be installed on some factory convertibles: please look to make sure that no sub-frame connectors are on your car before ordering. -RETURN POLICY: For two years from date of purchase, this exhaust is warrantied against defects in material and workmanship. Purchaser must call (909)466-0029 for a return authorization number before return shipment. Item must be returned postage pre paid. Items will not be accepted C.O.D. Any item that is custom made, is sold as is, with no warranty. No warranty that Campbell X-Pipe™ system will fit upon, or work with, any other aftermarket products made by other manufacturers. If in doubt, call before ordering. * LICENSED FOR PLEASURE USE ONLY. * New bayonet mounts ease installation & guarantee a perfect fit & finish. * 2 Chrome tips, or 2 Chrome megaphones (R opiton). -Acoustic Super Charger® beats scavenge every time! - Mustang 4.6 Cobra 1996-98 Complete 2 1/2" aluminized Cat-Back system. - Mustang 4.6 GT 1999-00 Complete 2 1/2" aluminized Cat-Back system. - Mustang 4.6 Cobra 1999-00 Complete 2 1/2" aluminized Cat-Back system.